The commerce of digital assets has allowed the exchange of different cryptocurrencies among millions of users in the network, that is to say, the globalization of said market. The public demands continue to grow, being necessary to develop trustworthy platforms where they can feel safe when making their transactions. With this in mind, the CATENA EXCHANGE platform has developed a ecentralized trading platform that leverages the disruptive capability of blockchain technology to transform the global trade economy. 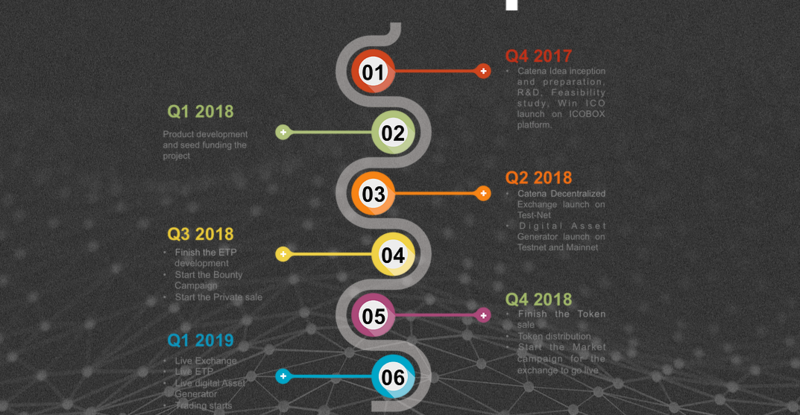 Catena is a decentralized trading platform that leverages the disruptive capability of blockchain technology to transform the global trade economy. Over the last three decades, global trade has significantly increased, both in volume and revenue. Despite alleviating the living conditions of many, the sector is still faced with challenges that inhibit the realization of its full potential. These are the issues that the Catena exchange intends to solve. The Catena executive team is made of seasoned professionals with vast experience in trading, manufacturing, technology, quality inspection and so on. Catena is built upon blockchain technology, which has created an opportunity to create new essential tools that have been missing in the trade economy thus far. These tools made by Catena will bring efficiency back into trading transactions, opening the doors for traders in ways never done before. Catena has the tools necessary to help small traders like apple farmers spread their reach in global trade. Goods and products trading will be easier than ever before, as Catena plans to stimulate the trading economy with efficient systems and tools that are usable by anyone. To be the largest trusted platform for global and domestic trades, and the first choice for all business transaction across the globe, with a mission of Empowering every business with a strong platform and powerful tools for growing their market reach and secure their business activities, while opening the door to limitless opportunities for small and medium enterprises, through transparency of market parameters and low entry barriers to compete, enabling a growing and prosperous trade economy. Firstly, the Catena trading platform will seek to eliminate the entry barriers and tackle the problems facing global trade. After providing a platform with small and medium-sized enterprises, Catena will shift focus to the provision of powerful instruments to facilitate the growth of the global trading market. While the platform’s architecture is mainly based on distributed ledger technology, it also incorporates aspects of Artificial Intelligence. Naturally, decentralized exchanges are difficult to establish due to their complexity. Nonetheless, the most notable advantage of such platforms is their independence, as they do not require a third-party service to hold investor funds. Instead, trades are facilitated directly between users suing the Catena platform. This, coupled with the immutability of the blockchain, makes transactions transparent and immune to fraud. 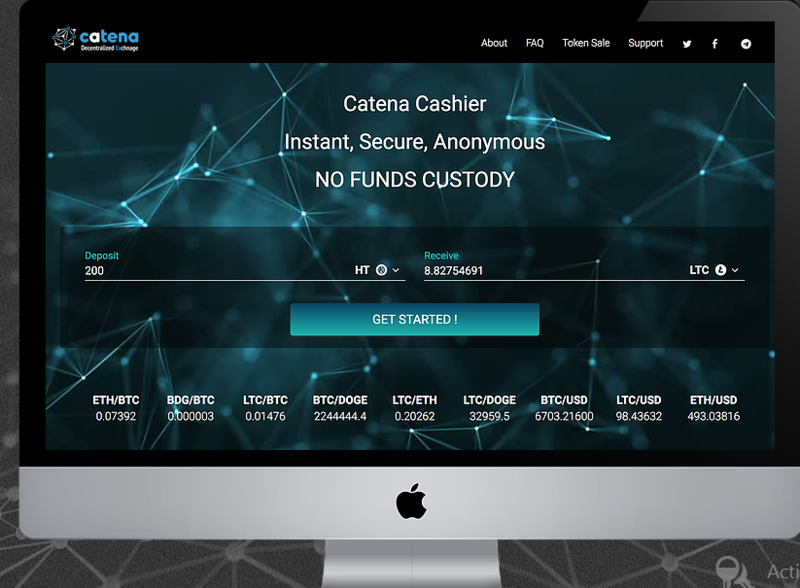 The flagship tool of the Catena platform is the Efficient Trading Platform (ETP), which was created to directly combat fraud and security problems in global trade. The ETP allows traders to select customizable smart contracts for each specific trade, without the need for knowledge in coding or advanced technology. Anyone from apple farmers to industrial equipment manufacturers will be able to select and customize contracts for each transaction seamlessly. Elimination of the middleman and removal of deceitful trade practices has been at the foundation of Catena and has continued to be the purpose of its development. Catena will bring large amounts of growth back to global trade with its innovative systems and plans to empower traders with tools that stimulate their independence. These contracts will work with a variety of receiving traders such as: single buyers, groups of buyers, retail, and awarded logistics suppliers. Catena’s ETP differentiates it from all other current trading platforms and will be influential in the goods and products trading economy. CATENA Token is an ERC20 compatible on the Ethereum blockchain, distributed by Catena during the stages of token sale. The CATENA token is a utility coin that will be essential for the system to function as it acts as the activation key for any smart contract to function, and will be used in all trading transactions empowered by Catena. 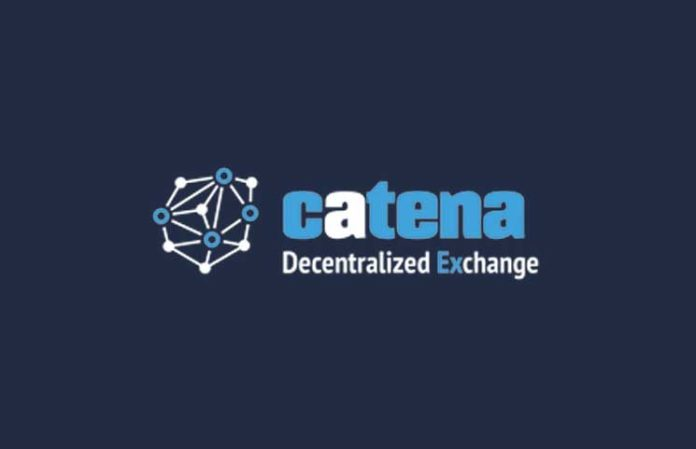 As, we want to facilitate the global and domestic trading, the scope and usage of CATENA token and its wallet puts forward its wide range of utility, so that people can use them on regular basis, everyday. The total supply is capped at 250 million, and no additional tokens will ever be minted. Notably, the Catena token will be the only acceptable currency in the Catena ecosystem.